"Logger Vision" is on display on a nightly basis at Copeland Park through the out-of-the-park graphics that are featured on the 17' x 30' High Definition Video Board that is located in left centerfield. "The Big Board" was installed in 2014 and is a state-of-the-art video board (15HD pixel layout) that is aided by the four, high-definition cameras that are in operaton nightly during Loggers Baseball games. The brainchild behind "Logger Vision" is the Elevate Media Group. Elevate Media Group is an award winning multi-media company based in La Crosse, WI specializing in video/ audio production, creative marketing, graphic design, and post-production services. 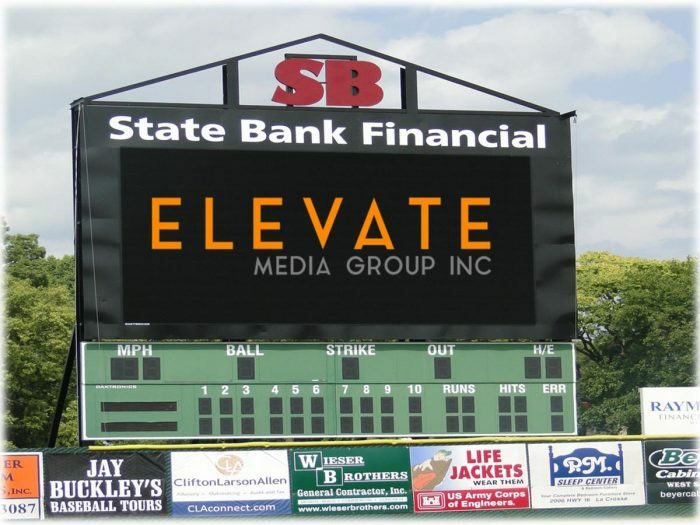 With over 30 years of multi-media experience, the Elevate Media Group is proud to be a part of the Loggers team and make your ballpark experience more memorable through the "Logger Vision" displays.